The tops are cracked open already because I just nestled in the butter to melt. Having a bucket of muffin batter in your fridge is a happy thing. It means that warm, tasty goodness is 15 minutes + oven preheating away. It's been a while since I've done a Monday Muffins post, so I wanted to give you an inexpensive, long-lasting recipe that just does a body good. I first tried these muffins when Debbie, of Salmon with Oranges fame, gave me a hot one oozing with a pat of butter. Oh goodness, that was delish! Of course, I asked for the recipe. It involved buying a name brand bran cereal and soaking it in hot water until the cereal turned into mush. So--I'd first pay to have that bran processed into a cereal shape, then in order to use it in the recipe I'd undo the processing I'd already paid for? Must be a more frugal way, I thought. And there is! 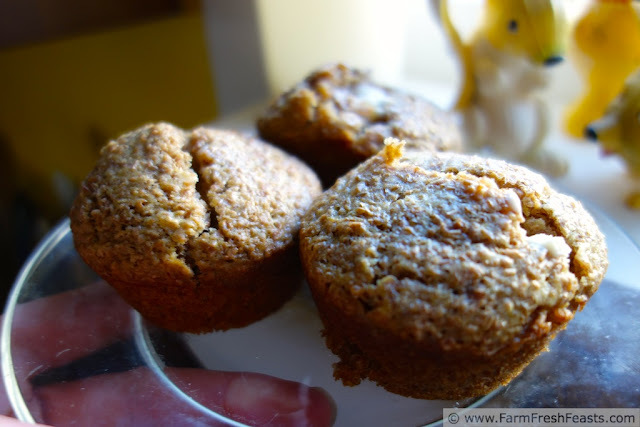 Buying a box of unprocessed bran saves a bunch of money on these muffins. Making your own buttermilk saves a bit more! Preheat oven to 400 degrees Fahrenheit. 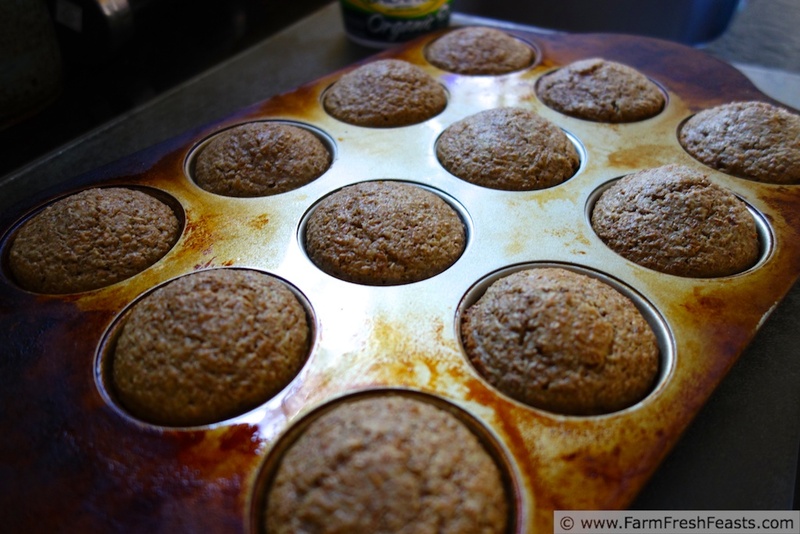 Spray a 12 cup muffin pan with oil spray or use paper liners. 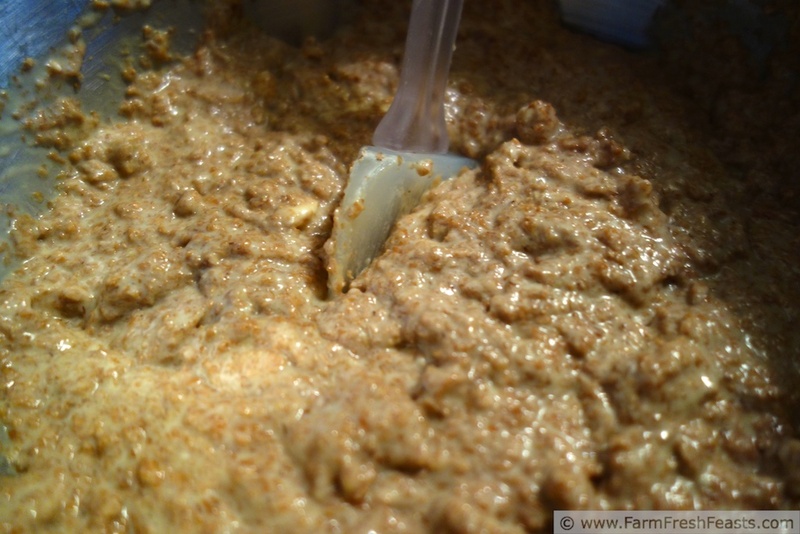 In a small bowl mix boiling water and 1 cup bran. Toss the butter on top to melt, and set aside. In a large bowl mix eggs, buttermilk and brown sugar. Stir in soaked bran until well-blended. 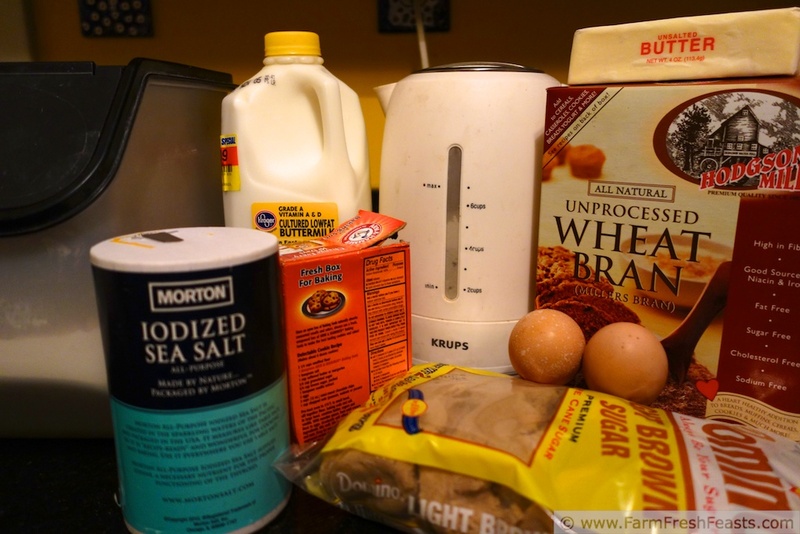 Dump dry ingredients (rest of bran, flour, salt and soda) on top and stir just until combined. Scoop** into muffin tin. Bake for 15 minutes. Cool in pan 5 minutes, then transfer to a cooling rack to finish cooling. This batter keeps up to a month in the fridge, so you can bake just the amount you want. The top of the batter will darken when exposed to oxygen. You can cover it with plastic wrap or just stir it in like I do. You're welcome to add raisins, dried Michigan cherries, chocolate chips, frozen berries, or nuts to the batter the day you bake, for added interest. I wouldn't leave those items in long term though. These muffins are shared with the clever chicks at the Clever Chicks Blog Hop at The Chicken Chick, the Wednesday Fresh Foods Link Up at Gastronomical Sovereignty, What's Cookin' Wednesday at Buns In My Oven, What's In The Box at In Her Chucks, Taste and Tell Thursdays, and the Farm Girl Blog Fest at Let This Mind Be In You. This is awesome! I love the idea of having muffin batter just waiting in the fridge for those muffin cravings to hit. I'm definitely going to try this - thanks, Kirsten! Glad to help--the muffins are delicious freshly baked, so it's easy to just do a few when you want them this way. Um, yes, please. These sound A.MAZ.ING. Yum! These are going in the to-try file! Do they taste the same as bran muffins made with the commercial bran cereal? Ah man, you know how I feel about your muffins. I will add these to the list to try because if you like them, I know they must be good. Rainy day bran is the best kind! And baking a hot fresh muffin on a rainy day? Even better! Mind...BLOWN!!! I've heard of the cereal unprocessing before, but DUH, I never thought of just using the actual bran! And I can't believe the batter keeps for THAT long! Ohhhh, you just struck my muffin chord, woman!! This has GOT to happen very very soon!! Since you strike my pancake chord all the time, I am ridiculously pleased to have struck your muffin chord. In a completely breakfast-bread-chord-striking way. great idea..........Thank you for sharing with the Clever Chicks Blog Hop this week; I hope you’ll join us again! My friend Debbie told me the melting butter (ok, in our case Smart Balance Organic Vegan Spread but who's asking?) is key. Those look lovely! Perfect to warm up in the toaster oven and spread a lump on butter on top and watch it melt...is it time for breakfast yet? Heather--see, that would be a PERFECT reason to have a toaster oven! I need to start drumming up toaster oven support, because I think I'd like one. Sure beats getting up early, preheating the big oven, and getting my entire pan dirty!